But we like coffee and alcohol! Here's what would be ideal though: if we can choose to enjoy these two treats. They won't have control over us. Yoga gives us a couple tools to help here. First, what are the conditions that usually pull us to grab a coffee or open up a bottle of wine? 1) Tired or just plain down in the dumps. Low, sad, unenergized, or a lump on the couch. In the extreme we could be in hypoarousal with feelings of apathy and numbness. Our bodies tell us we are uncomfortable with something. It's often an indefinable something that could be anything from simple sleep deprivation to a recurring self-deprecating dialogue. 2) Anxious, frantic, overwhelmed, or wheels running without direction. 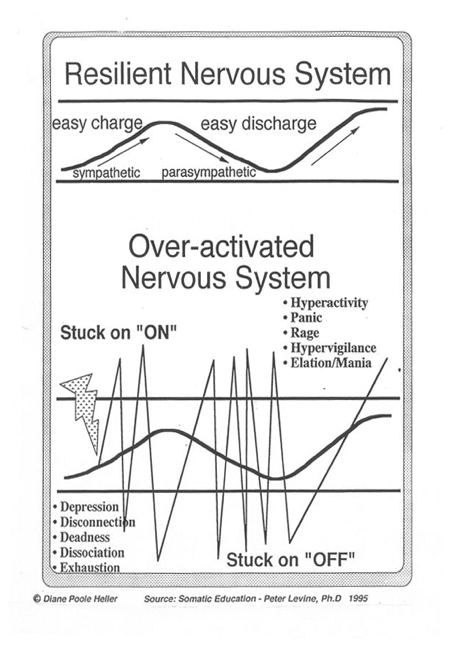 In the extreme we are in Hyperarousal where we are easily startled, panicked, and obsessive. We are outside of the safe zone and again, our bodies tell us something is not right. These could be times we reach for coffee or alcohol to "fix" it. We may reach for food, a screen, gambling or shopping too. Click here for graph and more detail on hyper and hypoarousal. Anything to stop these feelings! Yoga can help us here. Specifically, Pranayama*, one of the eight limbs of yoga, can help us. We breathe constantly! How can this help? Inhale as deeply as we can through our noses, letting our bellies soften and expand, counting the length. Exhale through our noses, doubling the length of our inhale. this is the most efficient way for us to lower our heart rate and calm our nervous system. Inhale as deeply as we can through our noses and hold our breath at the top of our inhale. We can do these in traffic, waiting in line, standing around waiting to go into a meeting. Even if we can only do these for five breaths, we will be closer to a window of tolerance, an equilibrium, where we can face the world a little easier. After these breaths, we may not feel such an urgent need for coffee or alcohol. In a calmer, or more optimally aroused state, we may still choose to enjoy a cup of coffee or a cocktail, but it will be coming from a place of strength rather than desperation. And we have to be calm in order to go forth and do those scary things that help us grow. *These are some of the simplest forms of pranayama (there are all sorts of ways to practice involving closing off nostrils, tongue, humming, etc.) yet incredibly effective.